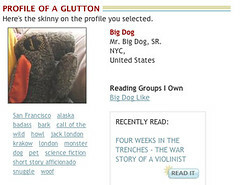 BookGlutton Profiles – See What I "Recently Read"
Check out the new Profile Pages – you’ll see what people have been reading. Naturally, if you set your preferences to “Read in Private,” you’ll be able to keep this a secret (that’s in the Account Section, btw) But why would you want to read alone? Following what people have been reading really helps connect. It’s also super addictive.